The results of a recent experimental study published in the March 2016 issue of Developmental Psychology found that not only what we say but how we say it may affect the development of emotional traits of a child starting at a very young age. We once thought that how a person was wired (temperament) was genetically determined but this study indicates that environment plays a big role as well. The experiment consisted of a researcher teaching children (15 months of age) how to play with toys while the child sat on their parent’s lap. Another researcher sat nearby (the “Emoter”) and would either would either with either anger (“That’s aggravating” in a stern voice) or neutral affect (“That’s interesting”) while the infants watched the demonstration. Later they let the children play with the toys. The babies who heard an angry reaction were less likely to play with the toys than those who heard the neutral reaction. So what does this mean for parents? 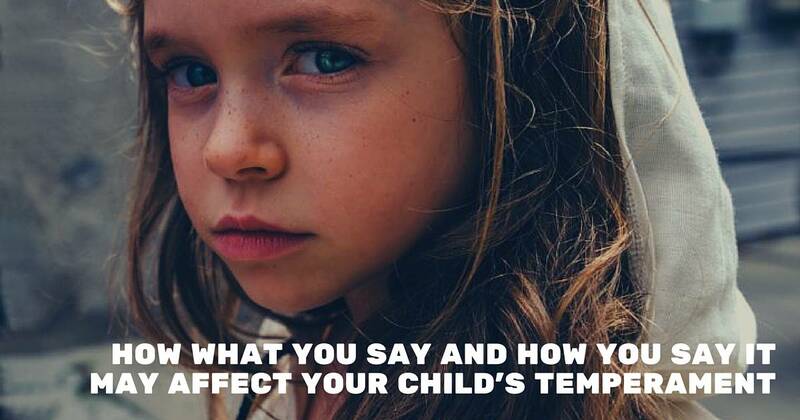 First it shows that what we say and how we say it effects not only a child’s behavior at the moment but how they react to future situations that are similar. From what we know about brain development, it is quite possible that continued exposure to this type of stimuli, especially if it occurs in different types of circumstances will gradually generalize to a more permanent reaction style to new and novel things they encounter. When a pattern of response is generalized like this it most likely indicates that the child’s brain has now been wired so that the child becomes more hesitant and fearful of various things they are exposed to in their environment. Parents can use this information in a positive way. By using a positive tone and positive statements while a baby or young child observes and experiences various situations we help them to react positively. One major fear children often have is a fear of the dark. When my children were babies, I would carry them through a dark room singing about how cool it was to be in the dark. Neither had a fear of the dark. Now, I would use a stern voice and say “not safe” if I saw them doing something that could be harmful and if needed remove them. I encourage you to become aware of what you say and how you say it so you will be better at encouraging your child to explore and interact with their environment especially to new things so they feel safe to explore and interact. When you see them doing things that are appropriate you can positive and motivating statements in a tone that it is encouraging as well. Use this to encourage children to try new things and to learn new skills. Parent/child communication is key to carrying out the basic tasks of a parent which include forming a close bond, understanding your child’s point of view, providing appropriate limits and guidance and teaching them skills, knowledge and values. Start being aware (mindful) of how you communicate with your child and how it effects them. Modify your communication style based on what you learn and begin to filter and actually formulate what you say and how to say it before you start. These modifications will “rewire” your parenting style and you will find that you will begin to respond to your child spontaneously in a very positive and effective style. One of my two favorite books for parents provides more details how to use this knowledge to encourage children to try new things, to learn to regulate their emotions and how to accept limits when necessary. The second helps you to better understand your child and teach important skills including emotional regulation, the development of curiosity and a positive self-concept. If you don’t already have them, I suggest you get a copy of How to Talk so Kids Will Listen & Listen so Kids Will Talk along with The Whole Brain Child.